David Lloyd George, 1st Earl Lloyd George of Dwyfor, OM, PC (Jan. 17, 1863-Mar. 26, 1945), was the British statesman who as leader of the British Liberal Party passed major social-welfare legislation and as Prime Minister (1916-1922) guided the nation through most of First World War and its aftermath. He was a major player at the Paris Peace Conference of 1919 that reordered the world after the Great War. He was one of the most powerful and successful prime ministers, but after 1922 his Liberal party disintegrated and he was ineffective in opposition. He was a devout evangelical and an icon of 20th century liberalism as the founder of the welfare state and winner of the First World War. Lloyd George was born to a Welsh family living temporarily in Manchester, England. His father William George was a Welsh schoolmaster who died when David was three. His mother and her two sons were supported by an uncle, Richard Lloyd (1834-1917), a Baptist minister and Liberal activist in North Wales who became a dominant influence on David. David was active in the Campbellite Baptists, a radical offshoot of the main Baptist denomination. Leaving school at 15 because it was too Anglican, he was largely self-taught. Deciding to be a solicitor, in 1884 he passed his bar examinations. He took an active part in local politics, fighting the landlords and the Church of England in Wales (which was an established church that collected tithes from dissenters and was distinct from the main Church of England.) After his party was badly defeated in 1886 he represented a new generation and rose rapidly in the ranks, winning a seat to Parliament in 1890 as Liberal member for Carnarvon Boroughs, by a mere 18 votes. The fiery orator soon became known for his vigorous attacks on the Conservatives and his championship of prohibition, Welsh nationalism, and disestablishment of the Church of England in Wales. During the Boer War, he bitterly opposed England's policy and was called by some "pro-Boer" and by others "little Englander." From 1905 to 1908 he was a member of Campbell-Bannerman's cabinet as president of the Board of Trade. He married Margaret (Maggie) Owen (1866–1941), a local farmer's daughter, in 1888. They had five children and lived property she owned in the village of Cricieth, in Wales; the children grew up speaking Welsh. She refused to live in London. After 1912 his secretary Frances Stevenson in London became his mistress and confidant; he married her in 1943 (two years after his first wife died). In 1908 Herbert Henry Asquith made him chancellor of the exchequer, the number two position in government. His closest ally was Winston Churchill; Lloyd George was the only person who ever dominated Churchill psychologically. In 1909 he introduced his famous budget imposing increased taxes on luxuries, liquor, tobacco, incomes, and land, so that money could be made available for the new welfare programs as well as new battleships. The nation's landowners (well represented in the House of Lords) were intensely angry at the new taxes. In the House of Commons Lloyd George gave a brilliant defense of the budget, which was attacked by the Conservatives. On the stump, most famously in his Limehouse speech, he denounced the Conservatives and the wealthy classes with all his very considerable oratorical power. The budget passed the Commons, but was defeated by the Conservative majority in the House of Lords. The elections of 1910 upheld the Liberal government and the budget finally passed the Lords. 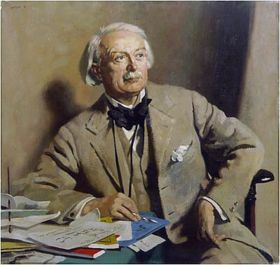 Subsequently, the Parliament Bill for social reform and Irish Home Rule, which Lloyd George strongly supported, was passed and the veto power of the House of Lords was greatly curtailed. In 1911 Lloyd George succeeded in putting through Parliament his National Insurance Act, making provision for sickness and invalidism, and this was followed by his Unemployment Insurance Act. There are certain indispensable qualities essential to the Chief Minister of the Crown in a great war. . . . Such a minister must have courage, composure, and judgment. All this Mr. Asquith possessed in a superlative degree. . . . But a war minister must also have vision, imagination and initiative--he must show untiring assiduity, must exercise constant oversight and supervision of every sphere of war activity, must possess driving force to energize this activity, must be in continuous consultation with experts, official and unofficial, as to the best means of utilising the resources of the country in conjunction with the Allies for the achievement of victory. If to this can be added a flair for conducting a great fight, then you have an ideal War Minister. Before going as peace delegate to the Paris Peace Conference, Lloyd George strengthened his position by winning the Khaki Election held in December 1918 amidst all the bitterness and fervid hero worship of the end of the war. At Versailles, Lloyd George, Woodrow Wilson of the U.S. and Georges Clemenceau of France concluded the peace, with Lloyd George, on the whole, on the side of generosity and moderation. the final Treaty of Versailles (1919) imposed huge reparations on Germany, created numerous small weak states in eastern Europe, and set up the League of Nations to head off future wars. It angered the Germans and was one reason for the rise of Hitler. From 1919 to 1922 his government steadily weakened, as the result of the railway and other strikes, of spending that irked the Conservatives, and economies that alienated the radicals; conditions in Ireland were appalling, yet no one liked the peace treaty of 1921 granting the Irish Free State Dominion status. The Conservatives were increasingly restless under Lloyd George's leadership, but it was the failure of his foreign policy that brought about his defeat. His pro-Greek policy was a failure because of the Turkish victory of 1922, and the Chanak declaration nearly involving Britain in war. The Conservatives revolted at this, Lloyd George resigned, and Andrew Bonar Law became prime minister. In opposition Lloyd George was not at all effective, partly because the Liberal Party had too few seats to be effective, partly because the Asquith Liberals wing of the party did not like Lloyd George, and partly because the Labour Party was taking over his liberal program of relief and reform. Nevertheless, in the economic depression of the 1930s, Lloyd George was the only political leader to put forward new and constructive ideas for dealing with unemployment. he consulted with major Liberal economists John Maynard Keynes and William Beveridge, whose proposals became national policy in the 1940s. In foreign affairs he supported the policy of appeasement, and held an unusually favourable opinion of Adolf Hitler. He twice refused to join Churchill's wartime cabinet. In 1944 he was made the first Earl Lloyd George of Dwyfor. His well-regarded memoirs include War Memoirs (6 vols., 1933-1936) and The Truth About the Peace Treaty (2 vols., 1938). He left an estate of £141,147 derived mostly from book royalties. Gaw, Jerry. Pending 2017 biography of Lloyd George based on the prime minister's membership in the Church of Christ. Wilson, Trevor. The Downfall of the Liberal Party 1914-1935. 1966. ↑ He added his uncle's surname to become Lloyd George. His surname is usually given as Lloyd George and sometimes as George. ↑ Jerry L. Gaw: Faculty & Staff at Lipscomb University. Lipscomb.edu. Retrieved on September 20, 2017. This page was last modified on 9 April 2019, at 02:07.